Lake Ridge residents have an opportunity to support trails in our community! The 2011 Board Election ballot will include a question asking members of Lake Ridge Parks and Recreation Association if they are in favor of leasing some Association Common Area land to Prince William County (PWC) to become part of a public walking trail from the McCoart Building to Occoquan. The proposed walking trail will connect residents with pathways to recreational opportunities, restaurants and retail establishments in Occoquan, and provide a scenic avenue for those who enjoy walking and jogging outdoors. The proposal would formalize an 8 mile trail from the McCoart Building to the historic town of Occoquan. Completion of this trail will be a cooperative act with Lake Ridge Parks and Recreation Association and other homeowner associations through which the trail will pass. While a number of informal trails currently exist in our wooded common areas, they lack connectivity that would make them more useful to nearby residents. Many segments extend toward the Occoquan reservoir, then terminate (just as some Lake Ridge streets do, such as Hedges Run, Mohican, and Antietam). If established, the proposed trail will link a number of those disjointed trail segments creating longer routes for walking or running, and establishing connected loops as an alternative to the current out-and-back routes. Many of the existing trail segments follow sewer line easements, and are well established. Additional natural surface pathways are envisioned taking advantage of minimal maintenance requirements where volunteer groups could play a major role in maintaining trails. Groups such as the Prince William Trails & Streams Coalition have performed hundreds of hours of volunteer work establishing and maintaining trails throughout the county, including work at our local Lake Ridge Park. An added benefit of leasing land to the County is that any liability is transferred to the County. 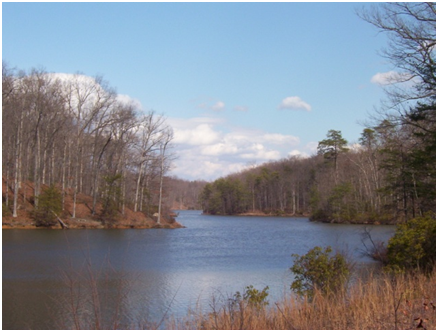 Lake Ridge is situated along the shores of the Occoquan reservoir where much of the common area is wooded and there is much scenic beauty for residents to enjoy. An expanded trail network will enhance that experience. Trails consistently rank high on surveys of recreational needs. The election begins on January 12. Watch for your ballot in the mail, or a letter from the Association with instructions for how to vote on-line, and let your association know how you feel about the added benefit presented to you through this opportunity. Don’t miss this chance to support trails in Lake Ridge.